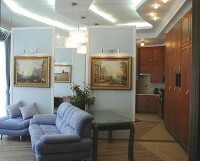 Apartments for daily rent in Kiev. Studio apartment 45 $ / Kiev / 2 , Husovskoho str. This small but cozy studio apartment is an ideal option for a single traveler or a couple travelling on a tight budget. It is located very close to the central area of Kiev, in so-called Quiet center, near metro Klovska. The apartment is equipped with all the kitchen, bed-linen, towels, soap, toilet paper. It is a decent, conveniently located accommodation at a very reasonably money. A standard studio apartment is situated in the Quiet Center of Kiev. It is within walking distance the park and Mariinsky Palace, Kreschatyk. There is a Market, supermarket, Metro station nearby. 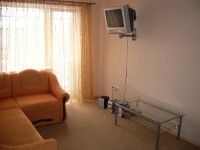 The apartment is equipped with everything you may need to feel comfortable in the capital of Ukraine. 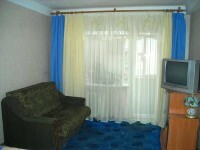 Studio apartment 55 $ / Kiev / , Darnitsa str. A standard, reasonably priced apartment for budget travelers. Location: near the Darnitsa metro station, on the left side of Dnipro river. Good access to metro and buses. The apartment consists of a bedroom, full kitchen and bathroom. 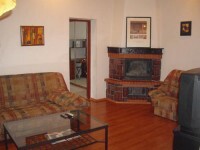 Amenities include: a TV-set, cable TV, fridge, washing machine. It sleeps 2 guests comfortably, max. 4 persons. 1-bedroom apartment 65 $ / Kiev / 85 , Velyka Vasylkivska str. This central, lovely 1-bedroom apartment is located within walking distance to Kievs main street Kreschatyk. There is a number of attractions, night clubs, restaurants nearby. The apartment is well-maintained and equipped with air-conditioning, satellite TV, DVD, washing machine, etc. It can sleep up to four guests with a queen size bed and a sofa converting into a comfortable double bed. The bathroom has a shower cubicle with hydro massage jets. 1-bedroom apartment 85 $ / Kiev / 84 , Velyka Vasylkivska str. This central, lovely 1-bedroom apartment is located within walking distance to the Kievs main street Kreschatyk. There is a number of attractions nearby, including the Olimpiysky Shopping Centre, Arena City entertainment centre, fitness clubs, night clubs, restaurants. The apartment is tastefully decorated and provides all the amenities you may need during your stay in the capital of Ukraine: air-conditioner, satellite TV, washing machine and others. 1-bedroom apartment 115 $ / Kiev / 9 , Kostelna Str. A luxury, modern, stylish one-bedroom apartment located in the very heart of Kiev, near Maydan Nezalezhnosti (Independence Square). A lovely view of the St. Michael's Golden-Domed Church and Saint Sophia Cathedral. Apartment amenities: king size bed with an orthopedic mattress, Cable & satellite TV, DVD, Internet. Completely fitted kitchen. The bathroom with heated floor has both a Jacuzzi bathtub and a shower cubicle. Apartment Security: a cipher code lock and video door phone & access controlled main entrance.